Research Branch, NC Office of Archives and History, 2015. The Resolves were a bold set of anti-British resolutions, adopted on May 31, 1775, at a meeting in Charlotte organized by Thomas Polk and they helped to fire a spirit of independence. On May 31, 1775, a committee led by Thomas Polk (and served by Ephraim Brevard as secretary) met at the Mecklenburg County courthouse, in the heart of Charlotte at present-day Trade and Tryon Streets, to adopt the Mecklenburg Resolves. Unlike the widely disputed “Mecklenburg Declaration of Independence,” the authenticity of the resolves is not in question. This was a radical set of resolutions, denying the authority of Parliament over the colonies and investing that power in the Provincial Congress, meeting that same week in New Bern. In the absence of an operational new government, the resolves set up some basic tenets. Anyone who received or exercised a commission from the Crown was deemed an “enemy to his country” and subject to arrest. The county’s militia companies were ordered to arm themselves and maintain vigilance. Others took note. 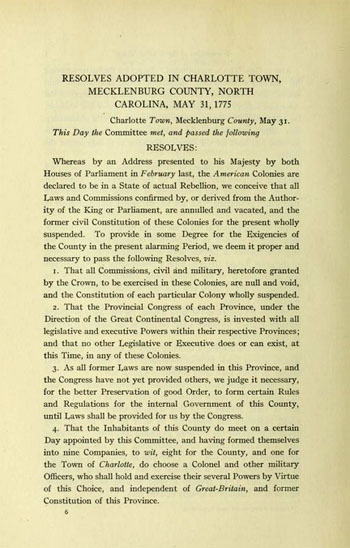 Similar resolves were adopted in Wilmington on June 19, Fayetteville on June 30, Pitt County on July 1, and Tryon County on August 14, all prelude to the Halifax Resolves, signed by delegates to the Fourth Provincial Congress on April 12, 1776, voicing support for independence for all colonies. Some articles say this never happened. Is that true? Thank you for question and for visiting NCpedia. Are you referring to the Mecklenburg Declaration? There has been controversy over it.